Feldspar, quartz and mica – These are the three most important types of rock spread all over the Ötztal. But there are many other glittering formations highly in demand with the “rock hunters” who keep the finding places of their “rock stars” secret. At least they love talking about their precious gemstones. Warm southern winds are blowing in the lower Ötztal. Now and then the sun shines through the cloudy sky, casting long shadows towards the larch wood. Absolute silence apart from the wind. 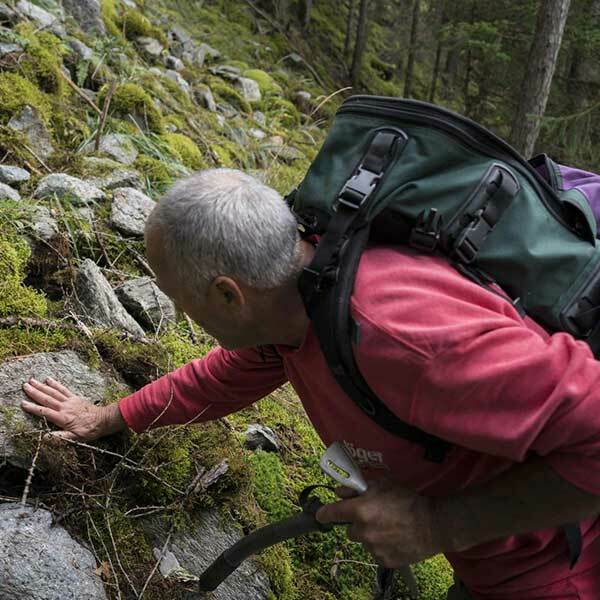 Walter Riml, a mineral collector from Umhausen, crosses the steep mountain flanks without saying a word. He works the mica and slate blocks with his old aluminum ice pick. Suddenly a huge smile appears on his face. Apparently he has found something. A silvery stone slab. Stone hunter Riml is setting off alone. Walter Riml’s passion does not retire. 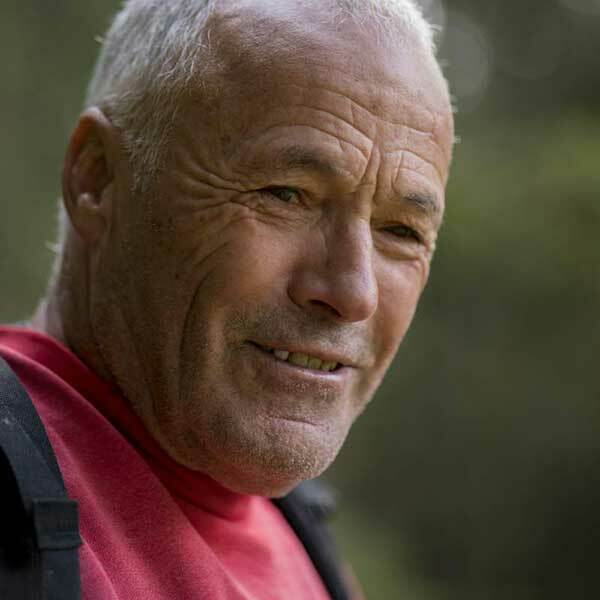 Walter Riml was a ski instructor, cross-country ski instructor and mountain walking guide before he retired. His great passion has always been the high Alpine mountain world. In the 1990s his South Tyrolean companion David Gufler brought him to think about “stone hunting”. Since then he has been exploring the main Alpine ridge in search of mountain crystals, garnets and other treasures made of stone. Also in the past, when he was a hiking guide, he took some groups on a journey of rock discovery to the mountain ridges and flanks of Gurgler Kamm saddle. “I already knew where the best places are, so all guests have found something,” he states with a twinkle in his eyes. If the experts only knew every Museum of Natural Science would be envious of Walter Riml’s precious collection. And he earned quite a bit of money thanks to his passion. The big hotels in the valley and the local tourist boards have often been grateful for his truly exclusive and unique findings. Today he goes stone hunting on his own, collecting all his treasures in the perfectly illuminated basement of his home in Umhausen. He enjoys his private exhibition and shows it – sometimes – to friends or guests. Real “rock stars” are always in the limelight. 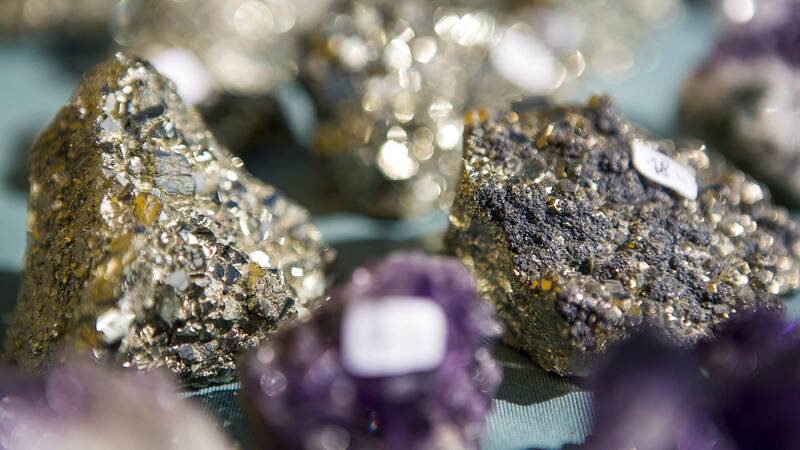 Keen eyes of expert mineral collectors won’t miss the slightest rarity. With or without the help of optical aids. Smoothly, in an almost loving way, Walter strokes a heavy rock slab covered with red and brownish garnets. 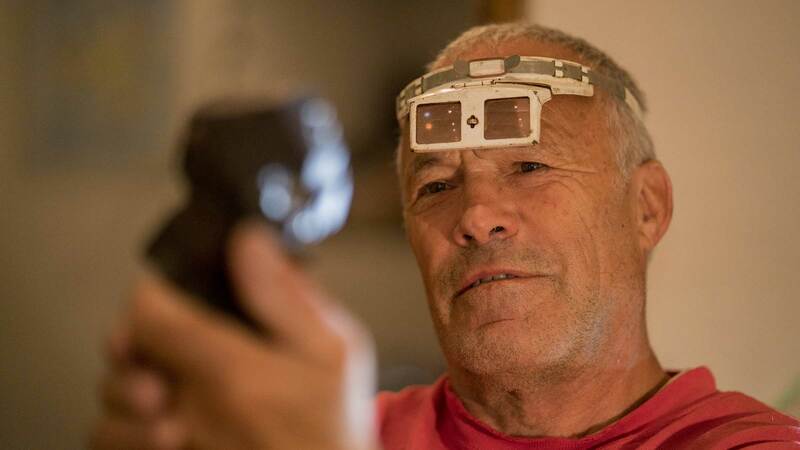 He turns on a small light by focusing on the center of the stone through his magnifying glasses. Checking accurately all inclusions and qualities, every single stone is a treasure. A collector of minerals can tell you heaps of stories about his exhibits. Over the last decades, Walter has carried hundreds of stones from Gurgler Kamm ridge down to the valley floor. 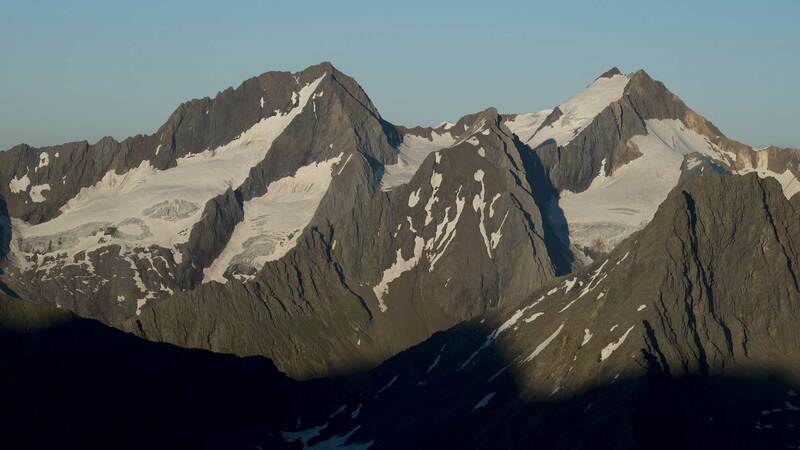 Exposed, steep, dangerous: Granatenkogel peak reveals its treasures only to experienced alpinists. Walter Riml climbed the scenic Granatenkogel peak about 150 times, taking heavy rocks of up to 30 kg down to the valley. His backpack was full of slate, mica, granite and muscovite. Maybe this is one of the reasons why he is in such a good physical shape although he is already 74 years old. He explains: “The mountain flanks of Granatenkogel are very precipitous, exposed and brittle. There is a high danger of falling and therefore the area is only suitable for very experienced alpinists.” Less expert mountain explorers should head for Gaisbergtal near Obergurgl, where little garnets can be found by the wayside. Finding and touching stones is the rock hunter’s passion. A mountain road in Ötztal. Walter Riml wants to show me a very outstanding place. Without saying a word he jumps out of my car, shoulders his old rucksack and spurts across the road. Only a few seconds later he has disappeared in the dense larch forest. Later I asked him why. Walter states: “I don’t want other locals or rock hunters to follow me and discover my place. I want to keep it secret as long as possible. Fortunately they don’t know your car here!” One thing is for sure, this passion is fired by indefatigable enthusiasm. Basically, searching for minerals is allowed in Tirol. But the respective regulation – § 28 of Tirol’s Nature Protection Law – also centers on the protection of minerals. Rock hunters are allowed to use only hammer and chisel in order to avoid any kind of crop damage (turfs, sods,…). The Ötztal Nature Park (Website currently only available in German) has published a special flyer “Faszination Geologie” in German, describing the most important types of rock, minerals and formations plus recommended walks and hiking tours giving an insight into the area’s petrography. 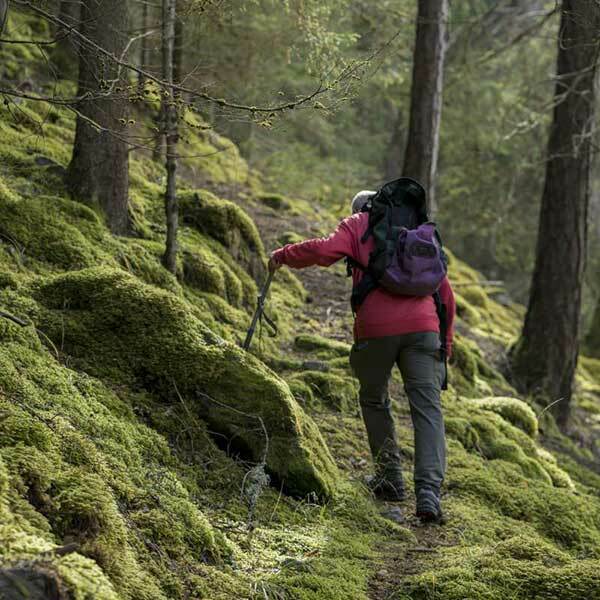 You can also join geology theme hikes guided by the Ötztal Nature Park experts. 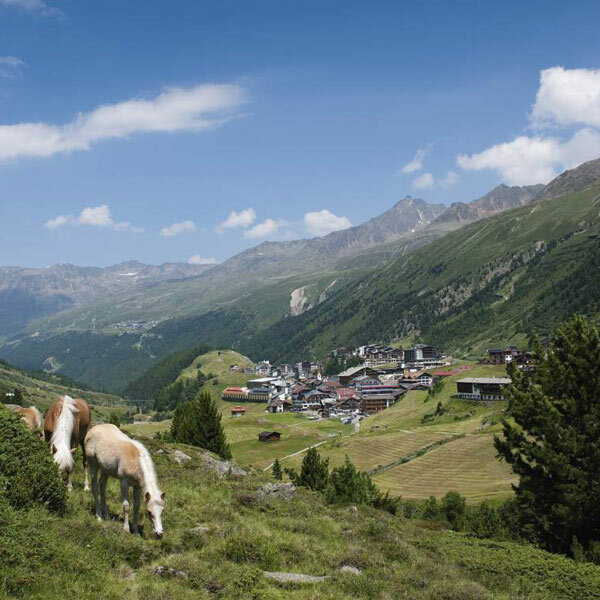 Another highlight is the GEMSTONE TIME route belonging to the ALMZEIT theme walking trail network towards FERIENCLUB Silbertal in Sölden. The mountain inn at 2040 m hosts Tirol’s biggest Mineral Museum. Bernd Ritschel loves and has explored the Ötztal Alps since he was a child and young adult. Born in the upper Bavarian village of Wolfratshausen in 1963, now he lives together with his family in Kochel am See. 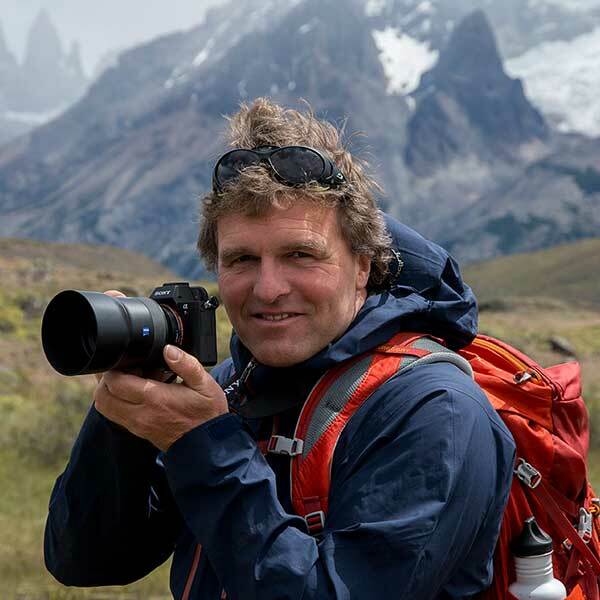 For more than 25 years already, his great passion has been photographing and describing the Ötztal Valley and its adjacent mountain areas. Several illustrated books about the Ötztal Alps, varied calendars, exhibitions, posters and series of postcards give an insight into his varied talents and the great love for this Alpine region. 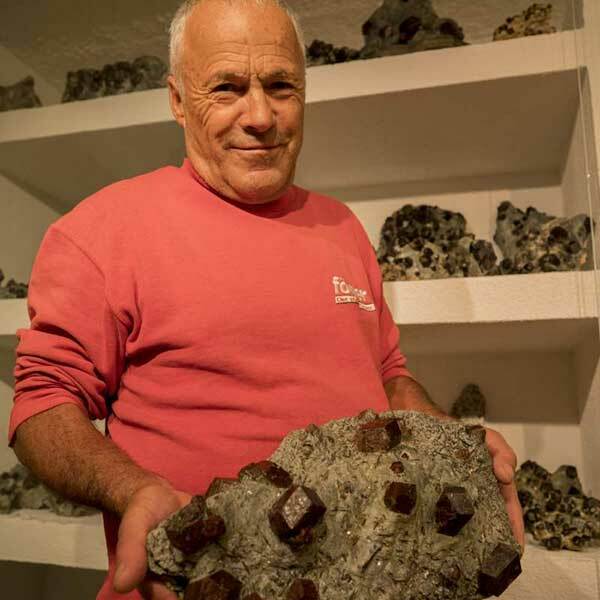 The new 2017 ÖTZTAL SUMMER MAGAZINE also gives a marvelous insight into Bernd Ritschel’s work: Read “Glamour and mystery of crystals” and admire his “Rock hunting pictures”! You want to know more about all highlights? This print magazine contains the most interesting and entertaining stories about Ötztal’s spring, summer and autumn season. Available in German, English and Dutch at all Ötztal Tourismus Information Offices. Order a free copy or read the online version at www.oetztal.com.